The waggie is possessed! Oh no. Add that to the list of fixes. Holy water and stuff. Not sure if oreillys stocks that. az chip wrote: The waggie is possessed! Oh no. Add that to the list of fixes. Holy water and stuff. Not sure if oreillys stocks that. Lol. It's just... Weird! I'm wondering if it's something in the drivers door master switch. I haven't pulled it apart and cleaned/lubed it like the passenger side yet. Maybe that'll help. Not a lot to report lately on the waggy. Last night in school I pulled the other two tires and changed the valve stems just to be safe. Also rebalanced all 4 and did a rotation. Spent a little more time messing with the speaker box... Maybe it'll be done someday. I noticed the last couple tanks of gas that it's been running kinda weird. Hesitation, some back burps, a little erratic. Today I filled up with premium to see if that changes anything. Since this is a long way from a new, high compression, performance motor, what could cause it to run so poorly on 87? Anyone have any thoughts?? tedlovesjeeps71 wrote: Not a lot to report lately on the waggy. Last night in school I pulled the other two tires and changed the valve stems just to be safe. Also rebalanced all 4 and did a rotation. Do you have a locking gas cap? Just wondering since the valve stem incident, maybe something got into the tank? I always check the inline fuel filter to see if there is crud in it, too. Interesting thought.... Which didn't even occur to me. no locking cap so I guess it's possible. I'll run this rank and see how it does. I ran premium all the way to Ouray and it was ok. Sorry to give out that kind of negative vibe, but it was my first thought. I'd still check the inline fuel filter. I use the clear plastic versions so I can see what's getting caught up in them. No... I'm lucky enough that I'd be targeted for something stupid like that. I'll look... There's a clear filter before the pump on the frame. Hopefully it's clean. Since the FIL is coming into town next week I'm having to put all the projects on hold. That also means, unfortunately, that all the tools, spare parts, etc that have been hiding (sorta) in the spare bedroom all need to go to storage. Ugh. In an effort to keep from making it too much duplicate work, I decided to kill a few birds with the same stone. 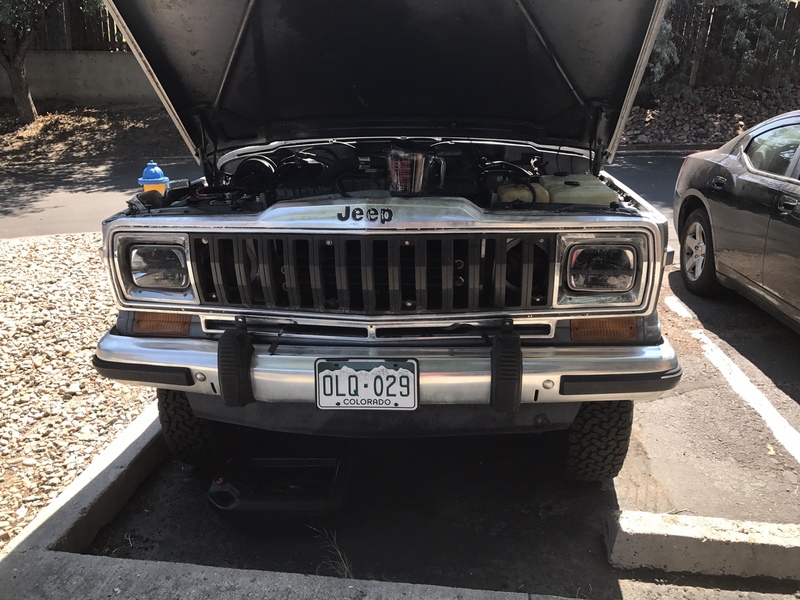 Gave Walter an oil change. Now the new filter is out of the way, the jug of oil and my drain pan can go to storage. The muscle isn't perfect but hopefully if I polish at it there will be more shine. Also pulled off the broken fog lights as I got tired of seeing their rusty selves. Not sure what will replace them since all my "extra" off road lights are round. I think that may look weird. We'll see. Ok, time to get back to moving stuff around. 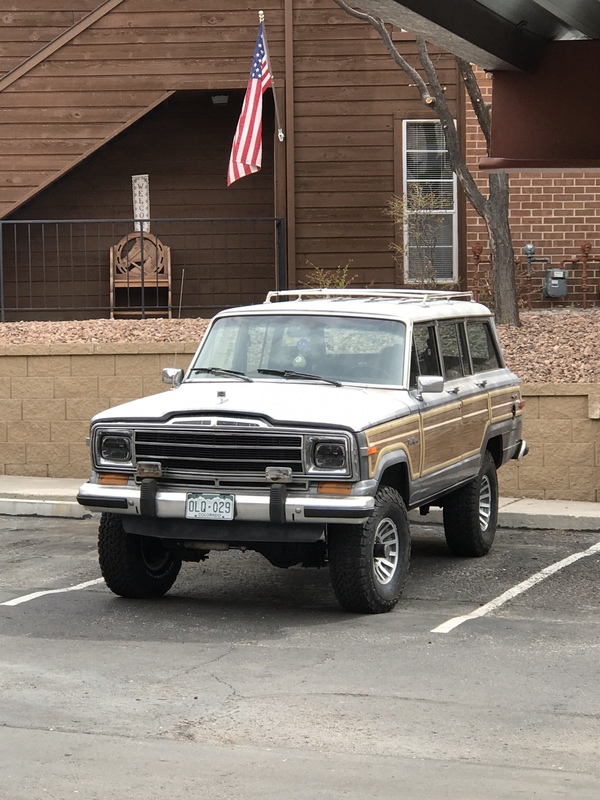 The muscle grill is my favorite in the "newer" Jeeps- but with either grill, your Wagoneer is looking good; it has a great stance. 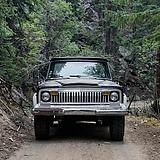 66stepside wrote: The muscle grill is my favorite in the "newer" Jeeps- but with either grill, your Wagoneer is looking good; it has a great stance. My favorite is undoubtedly the rhino setup, then the razor, then muscle. Unfortunately, this being a 91 and my effort to keep things easily reversible, it was muscle or nothing. Wasn't about to try and fit round headlights (which I prefer), especially after we bought these expensive trucklites. Your Waggy has "Muscle" now! I like it. az chip wrote: Your Waggy has "Muscle" now! I like it. Lol. Thanks! If I can iron out the fuel injection to where it seems 100% correct, it may have a lil muscle. Haven't had much time (or honestly interest) to mess with the waggy much lately. Been DDing it to school everyday and suffering through the oddities that are occurring with the fuel injection. Got to school a little early today and decided to pop the hood and see if I could notice something/anything. It's not running hot and has more power by far than the carb did. But it does some annoying things. Sometimes when I give it gas from a stop it will stutter and baby cough through the tbi. Too much pedal only amplifies it. It whistles. I notice it while idling through my apartment complex when I go home at night. It sounds vaguely like a turbo. I had thought perhaps it was a vacuum leak so today I ran a propane torch around everything to see if the idle changed. Nothing. If I gently open the throttle just a fuzz I can hear the whistle. Sounds to be coming from the tbi area. This is a brand new Hamilton kit so I can't see how anything is worn out. Anyone have any ideas or thoughts?? Are the injectors seated properly? I had mine out of rotation once. Did not sound good. Although yours sounds more vacuum whistle than mine. Check for throttle plate being wobbly. TPS is tight? Any other vacuum stuff loose? Did you miss any ports by chance? Pretty sure I've got all the ports plugged etc. Hopefully Friday I can dig a little deeper. 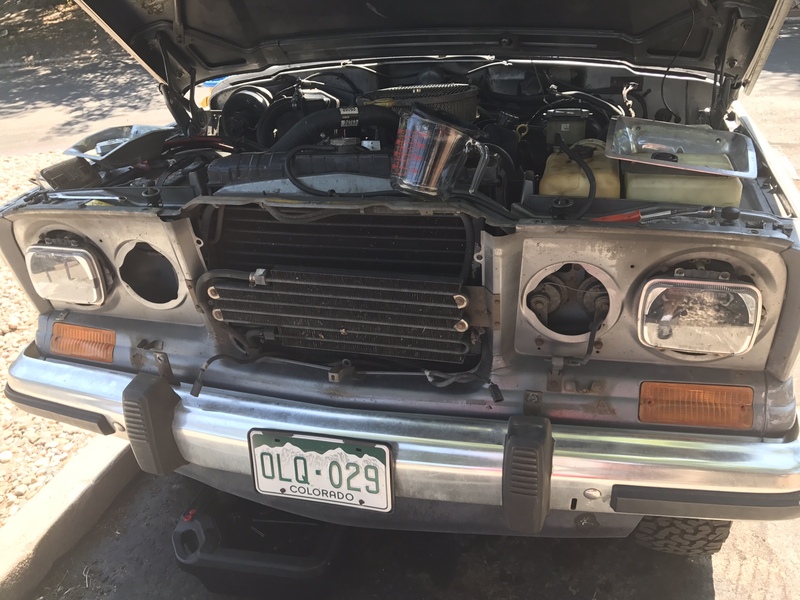 Need to run a vac line to the ball so the cruise, 4x4, and heater stuff works again. Currently the rear CTO is all capped. Guess I'll tie into that one?? It could just be that your engine is so nice and quiet that you can hear the IAC whistling. Nikkormat wrote: It could just be that your engine is so nice and quiet that you can hear the IAC whistling. Hahahahahahahahahahahahahahahahahahahahahahahahahahahahahah...! That'll be the day. Hey man I wouldn't doubt it, my IAC was never set right but I could hear that thing over the 401 on teenager exhaust.